I’m a walker. At home, I take my dog, Gaby, for long morning jaunts through the neighborhoods or nearby state park. When I travel, I try to make time to wander. 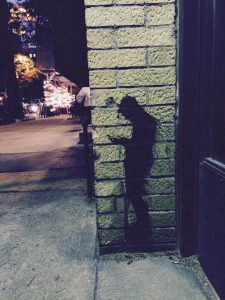 I take ghost tours, which are great ways to learn the history of an area as well as local legends and scandals. I window-shop. And sometimes, I stumble upon unexpected art. A couple of years ago, during a visit to New York, I spotted these images. 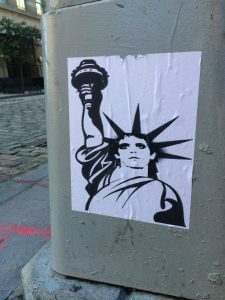 I’m pretty sure I was walking through the West Village when I came upon Liberty Lou Reed. Phone Guy turned up nearer the Meatpacking District; I also spotted his brother decorating a nearby sidewalk. This past May, I took a research trip to Park City, Utah. Originally a mining town, it’s known now as a ski resort and the site of the Sundance Film Festival. 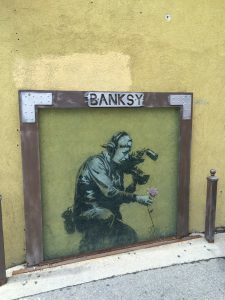 One evening, I signed up for a ghost tour, and in addition to locations of long ago murders and mayhem, our small group also visited a few alleyways to see graffiti left by Banksy, the UK artist. 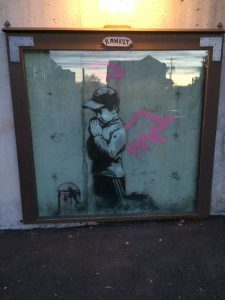 These works were set off with frames and protective shielding, but according to our guide, at least one piece was painted over by folks who didn’t want graffiti on their building no matter how famous the artist. 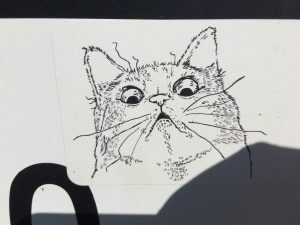 I don’t expect to find unexpected art close to home, so during a recent walk along a park trail, I was surprised to find these images stuck to a sign. 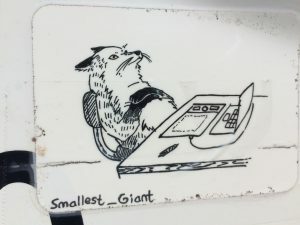 When I got home, I searched for Smallest_Giant online, and found several sites on which folks had posted drawings and photos of images, including the very same daydreaming fox and cat that I had spotted. I thought it was neat that the same images that I saw had been viewed and photographed by others, and that there are places online where these bits of whimsy can be displayed. ← Previous Previous post: Slowly but surely….